Annie Demen is a dynamic and highly trained development professional with local and international experience. Annie has vast experience working and collaborating with the Liberian Government, UN Agencies, and international organizations. Presently, she serves as Deputy Executive Director for the Agency for Economic Development and Empowerment (AEDE). 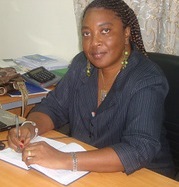 She has worked in 14 of Liberia’s 15 counties conducting consultancies either solo or as part of a multicultural team. Annie earned an MA in Sustainable Development, from the School for International Training (SIT) USA (now SIT Graduate Institute) and a BSc in Economics and Accounting from the University of Liberia. She also earned a Diploma in Population and Sustainable Development from the University of Botswana, under the UNFPA Global Programme in Population and Sustainable Development, as well as several certificates in other disciplines. She is also a certified International Finance Corporation (IFC) Business Edge Trainer and has Advance Participatory skills.